Max prints an error report in the Max window when you make a programming mistake. Click on the error message you want to trace in the Max window. The error message will be highlighted. Click on the Show Object icon on the Max window toolbar. The Max object associated with the error message will appear, highlighted with a green tinge. If the object is contained in a subpatch, the subpatch will open in an unlocked Patcher window. When you make an error while programming with Max that requires your immediate attention, the error is reported in a dialog box. The most common of these errors is a Stack Overflow. It is possible to get Max working so hard it does not have time to respond to your commands (say, if you have a number of metro objects sending out bang messages as fast as they can, or if you have created a loop that overloads Max, causing a Stack Overflow error). 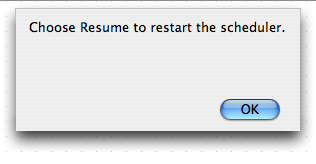 When this happens, you may need to stop the Max scheduler, restart the scheduler, or both. When Max's timer is stopped, you will see a message in a dialog box. Choose Resume from the Edit menu. The Max scheduler will restart. Below is a list of error messages you may encounter, along with likely causes of each message. Occurs when you refer to an argument number out of the range $1 - $9 in a message sent to a message box. <filename>: error opening file (and variations). An error occurred opening a file that was properly located. Most likely the file or media has a problem. Occurs when a patch is loading or when an object is created that reads its data from a separate file. The file that was to be read in automatically was not found in Max's search path or was not a type of file that the object is capable of opening. The erroneous filename has usually been specified as an argument to an object such as coll, seq or table. Make sure that the file is in Max's search path. Occurs when creating a new object with typed-in arguments. There is something wrong with what you typed after the name of an object. Usually the object is expecting a symbol, and you typed in a number, or vice versa. Check the object's argument specification list on the Reference page. Occurs when an object receives a message that it understands, but one of the arguments in the message is not what the receiving object expected. Usually the object was expecting a symbol argument and got a number, or vice versa. Check the object's input list on the Reference page. Occurs when an object receives a message that it doesn't expect. It is possible to make patch cord connections that will result in improper messages being sent to an inlet. For example, Max will let you connect the outlet of a message box to almost any inlet, because there's no way of knowing what message will come out of the outlet. In such a case, the error does not become evident until you test the program and the message is actually sent. A message was sent that contained more elements than the object can handle. Occurs when an object receives a message that it understands, but one or more of the expected arguments in the message is missing. Check the object's input description on the Reference page. Occurs when creating a new object or loading a document. When you are editing a patcher, and you type the name of a nonexistent object into an object box (or the name of an object or subpatch that is not in Max's search path), Max produces this error message. When you open a document that contains an object that Max cannot find (either because it is not located in Max's search path or because it just doesn't exist), Max displays the object as if it existed, except that the object name is surrounded by a dotted outline in the object box, and an error message is printed in the Max window. This preserves the connections to the object box in case you can retype the object to create it properly. A similar box is created when a user interface object referenced inside a file cannot be located. This error occurs when a collective references an external object that has been improperly stored in the collective. It should not happen with the current version of Max. This error occurs when a file name is either passed to an object as the argument to a read message or stored within an object saved within a patcher. The file cannot be located, either within Max's search path or with its full pathname. Occurs when a patch is running and a symbol is received in the inlet of a bitwise operator such as &, |, <, or >. Make sure that only number messages are sent to bitwise operators. Occurs when a message is sent to a send object, or to a message box that contains a semicolon followed by the name of a receiver, and there is no receive object with the name specified in the send object or message box. Occurs when the element that follows a semicolon in a message box (specifying a receiver for the message) is not a symbol. The file you tried to open is corrupted or is not a properly formatted Max document. Restore the file from a backup copy if available. There is insufficient memory to write the file you're trying to save. If possible, close other files and windows that don't relate to the file you're saving. (Windows only) This message is sent to the max window when audio is stopped if floating point exceptions were caught while processing audio. The tells you how many exceptions were caught to give you an indication of the severity of the problem. This can be triggered by underflow of float-ing point operations causing denormal numbers to be generated. You may want to try modifying your patcher to cause the exceptions to stop as it may affect the performance. ad_mme: unable to open wave input device. ad_mme: unable to open wave output device. ad_mme: unable to start output. ad_mme: unable to start input. ad_mme: stopping due to error. ad_mme: No MME input or output devices found. (Windows only) Please check that you have the latest driver update for your audio device. Please exit all other audio applications, reboot if necessary, and try again. Also, please check your settings in the DSP Status window to insure appropriate choices are selected for Input Device, Output Device, Sampling Rate, IO Vector Size, and Signal Vector Size. If the problem persists, contact Cycling '74 support. ad_directsound: can't create directsound object. ad_directsound: can't create directsoundcapture object. ad_directsound: Failed to set cooperative level to priority. ad_directsound: Failed to create primary buffer. ad_directsound: Failed to set format of primary buffer. ad_directsound: failed to create output DirectSoundBuffer. ad_ds: No directsound input or output devices found. ad_directsound: unable to Play output buffer. ad_directsound: unable to Start input buffer. ad_directsound: stopping due to error. (Windows only) A problem was encountered initializing the ASIO device. Please check that you have the latest driver update from your audio device manufacturer. Please also try different settings for the device buffer sizes and latency in the control panel for your audio device provided by your device manufacturer. Check that another audio application is not using the audio device. Also check that the audio device is not the default audio device for Windows System Sounds. Same as <objectname>: doesn't understand <message selector>. Occurs when the patch is running and a bag, float, int, pack, or table object receives a send message without an argument, or with an argument that is not a symbol or is not the name of an existing receive object. Advisory message produced when you try to connect an outlet to an inlet that doesn't understand the message sent by the outlet. You will also notice that the inlet was not highlighted when you dragged the mouse over it. An external object that depends upon a particular shared library was not loaded because the shared library is not available. You'll see this error if you try to use an object for MSP with the non-MSP version of Max (the missing library will be called MaxAudioLib in this case) or if you try to use some external objects created for an earlier version of Max/MSP. Otherwise, to solve this problem, you may need to relocate the shared library or update your system. This message occurs when an object attempts to allocate too much memory at interrupt level. Unless it represents a bug in the object, it may mean that you'll have to modify your patch to use a defer object where memory is being allocated. One example would be attempting to store large lists of data in a coll object. See the defer Reference page for more details. Occurs when there is a bug in the Max application or in an external object. Please report the con tents and context of any such message to Cycling '74. (Windows only) A necessary QuickTime function was not found. Make sure you have installed QuickTime for Windows and chosen a complete install of all optional components. Occurs when Max is installing an external object in the startup folder. The external object file is damaged. Try restoring a copy from the original disk. Occurs when a patch is loaded or when a funbuff object is created that reads in from a separate file. There was an error in reading a file into a funbuff object, either because the file was not in the proper format (it must start with the word funbuff, followed by a space-separated list of numbers) or because a Max or text file with that name could not be found. Ensure that the file is in located in Max's search path, and that it is in the proper format. Occurs when you try to connect the right outlet of a grab object to the wrong inlet of another object. The right outlet of the grab object should be connected only to the leftmost inlet of other objects. Occurs when you create a graphic object with a name that has already been taken by another object, such as a table or send/receive object pair. Occurs when a patch is running and an object receives a message that it doesn't expect in some inlet other than the left inlet. (Windows only) Max was unable to open the MIDI input or output device. Please exit from all other MIDI applications and try again. (Windows only) A problem was encountered loading the ASIO driver. Please check that you have the latest driver update from your audio device manufacturer. Check that another audio application is not using the audio device. Also check that the audio device is not the default audio device for Windows System Sounds. No help available for <objectname>. A help file in the max-help folder cannot be located for the named object. Restore the help file from your original Max disks. This error occurs when you are testing a standalone application and the Search for Missing Files option has been turned off. The named object or file has not been included in the collective from which the standalone was created, and since the runtime Max is not going to look for the file, it declares it missing after it was not found inside the standalone as a resource. The file is too large to be opened. Note that to open a patcher file you need more memory than would be required to actually use the file. Indicates that you typed a comma or a semicolon character into an object box. If this error occurs when reading in a patch, it is likely that the file is damaged. A keyword argument to the script message to sent to the thispatcher object is not recognized. Occurs when editing the name or arguments of an object that has already been created in a patcher, and patch cords that used to be connected to the object can no longer be connected. Changing the contents of the object box may change an object's number of inlets or outlets, or Max may be unable to create the object at all if you type in the wrong thing. (Windows only) You are trying to load a QuickTime image but your display resolution is set to 8- bit color depth. Change your Display Settings to increase your Color Depth, preferably to 24 or 32 bits. Occurs when a file is read into an object. Max encountered an error reading a file and could not load in the data. Check to make sure that the file is in the proper format for the object reading it in. Occurs when installing an external object. This message (especially if you see a lot of them) may indicate a problem with the Max Temp file used to store resources for external objects. If you only see one or two of these errors, it may be a resource missing in the object or a conflict between two or more objects attempting to use the same ID number. If XXXX is STR#, this problem only affects the strings shown when getting assistance on an object and should not be considered a major problem. Occurs when installing an external object. The external object file is corrupted. Restore a new copy of the external object from your original disk. Occurs when a script message to the thispatcher object references a variable that is no longer assigned to an object. Occurs when a script message to the thispatcher object references a variable that has not yet been defined or given a value. Occurs when using the nth script message to the thispatcher object and the specified index is greater than the number of objects of the specified class in the patcher. Occurs when a script message to the thispatcher object attempts to assign an object to a variable name that is already been used. This error will not occur if you choose Name... from the Object menu to assign a name to an object. Occurs when you type in a name as an argument to a send or receive object which is already being used for a table object or some other object. Occurs when the patch is running and some message other than an int is received in the inlet of an sxformat object. Occurs when opening a Max document. The document has been damaged. Unable to load MaxQuickTime.dll. Error code. (Windows only) A required component of Max was missing. Try reinstalling to see if it fixes the problem. If not please contact Cycling '74 support and provide the message and that was reported. Occurs when an object is given more typed-in arguments than it expects, or when too many arguments are present in an incoming message. Usually this is just a warning of something that is not quite right but is basically harmless. Occurs when a port argument is typed into the object box of a MIDI object, and the port name is not currently valid. The valid port names are listed in the MIDI Setup dialog box. The default port is the first name in the device list in the MIDI Setup dialog.